Over the years we’ve made a few changes to the house and property so that, if I don’t exactly love the place, I have at least developed some fondness for it. And the persimmon tree remains one of its abiding delights. 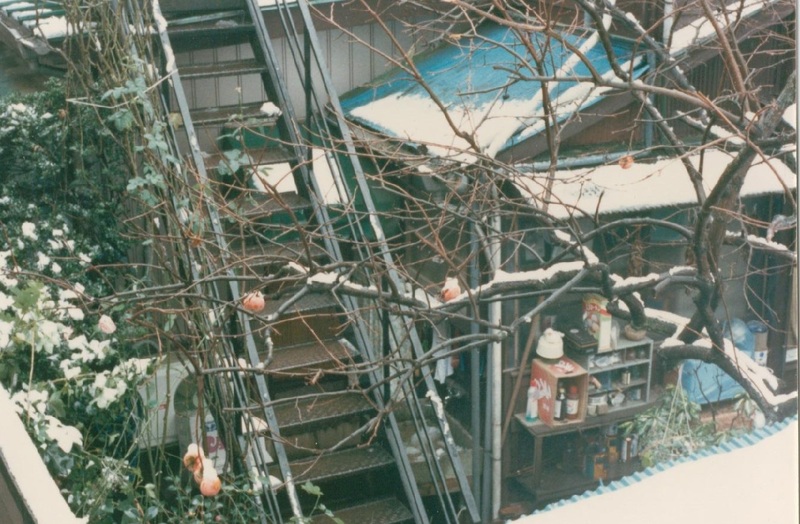 In the densely packed, older Yokohama neighborhood where my husband and I lived the first year we were married, even tiny yards often featured a lovingly tended persimmon tree. I’m posting a picture I took then of a Hachiya persimmon tree in a neighbor’s yard after an early, surprise snowfall. 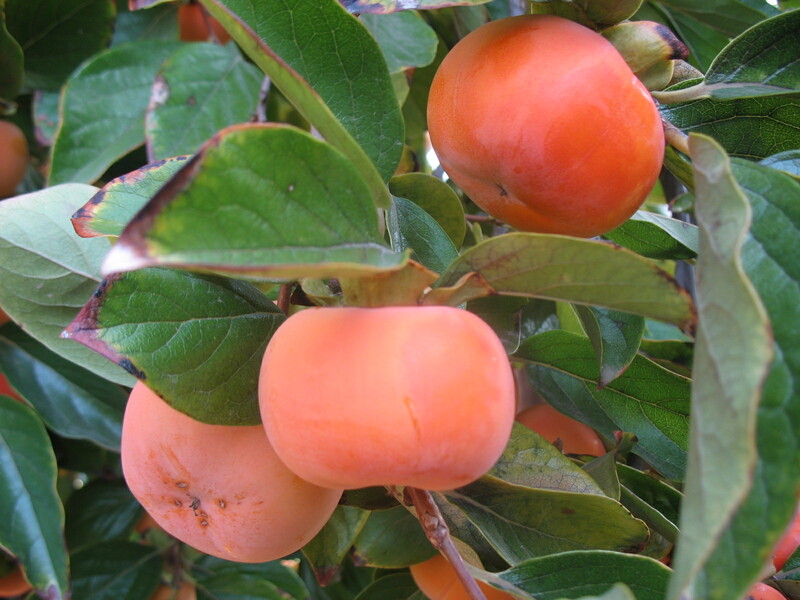 Funny how memory works, though: I could have sworn there had been more persimmons left on the tree. It’s as if in the intervening decades, they’ve been falling slowly out of the photo. You might have to click to enlarge the photo to even see the fruit. 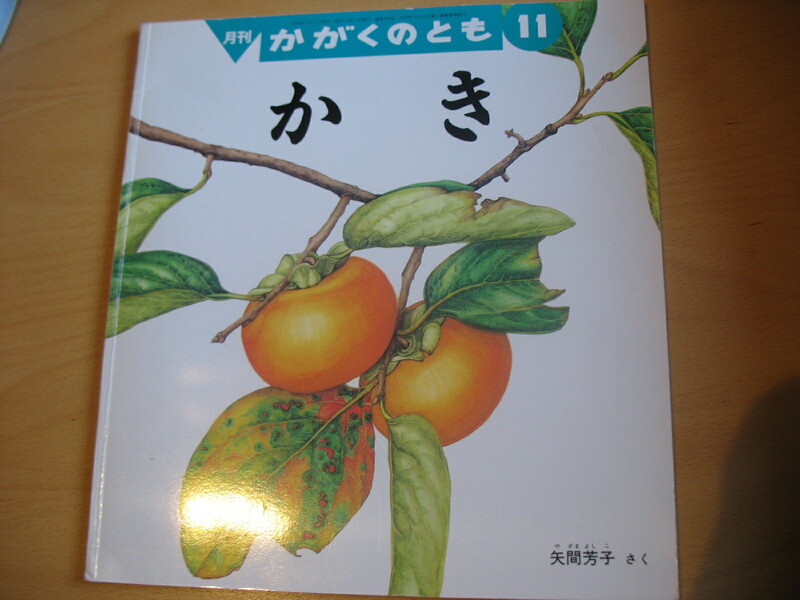 A few months ago, in one of those serendipitous moments that could only happen in a used bookstore, I found a Japanese children’s book called Kaki (Persimmons). This was at our soon-to-be-only used bookstore in Davis, the wonderful Logos Books. Basically a first-grade primer on what every Japanese kid should know about persimmons, Kaki explains the difference between Fuyu and Hachiya persimmons (which it calls “sweet” and “bitter” persimmons); instructs how to eat and dry and store them; provides recipes for stir-fried persimmon, persimmon sandwiches, and persimmon-leaf tea; and gives step-by-step illustrated instructions for making a persimmon-leaf doll. I cannot wait to try some of these things, although I’m not sure about the suggestion to hasten the sweetening of Hachiya persimmons by floating them in leftover bathwater. (This doesn’t sound that gross in Japan, where the tub is used for soaking in only after one washes and rinses, but still….) Many pages feature lovely illustrations of perfectly shaped persimmons and elegant persimmon trees. Our own persimmon tree is an ungainly affair, too tall for its girth and leaning Pisa-like toward the southeast despite some early efforts to straighten it. But it’s hardy and productive. In a good year we get hundreds of persimmons. This is a good year. My husband and sons and I picked about 80 fruit a couple of weeks ago, and they’re nearly gone. We’ve eaten them fresh, peeled and sliced for a snack or julienned into salads. We’ve given them away to persimmon-loving friends. 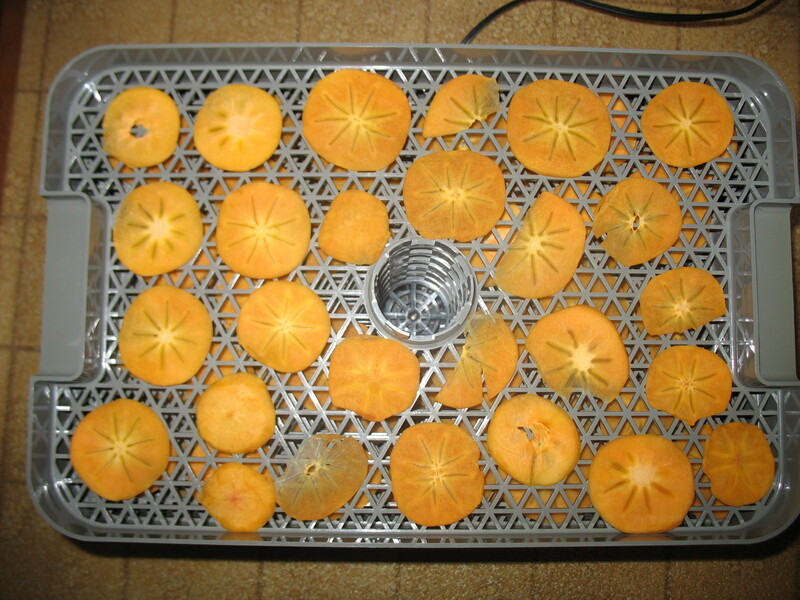 About half of them ended up in our dehydrator, the better to enjoy persimmons the rest of the year. And last night my husband made Braised Pork with Fuyu Persimmon, a recipe I found at epicurious.com. If you are of a pork-eating persuasion, I recommend this dish: (1) It is scrumptious; (2) it makes your house smell amazing; (3) it uses up a pound and a half of persimmons; and (4) it gives your teenage sons an opportunity to take the excess fat rendered from the pork shoulder and make a pork fat lamp at the dinner table. But that is only 80 persimmons down, and the tree still looks like a penitent, limbs bowed down with the weight of ever riper fruit. That will change tomorrow, when the good folks from Village Harvest come and pick the rest. They’ll leave us whatever we want—I’ll ask for 15–20 pounds—and deliver the rest to a local food bank. What the harvesters can’t safely reach at the top of the tree will be left for the birds. In the past, I have stood at my window both delighted and unnerved by the sight of flickers, mockingbirds, sparrows, and finches feeding simultaneously in the tree, as if posing for one of those ornithologically replete “Tree of Life” images. This makes me miss the Bay Area (a big feat). And persimmons. I guess at the very least, I’ll be back in the Bay Area soon–and I’ll be showing down on persimmons then. Thanks, Christine & Beth. Maybe I need to start a business shipping “nostalgia” persimmon boxes to folks who’ve moved to persimmon-less climes! your sons made a pork fat lamp? really? Yes, really! They siphoned off some of the fat from the dish (this cut of pork was particularly fatty), put it in an empty votive candle holder, took a wick from a small candle, placed it in the holder, and lit it! Small flame, rather pinkish. We turned off all the lights so we could appreciate it for a few minutes.